One of the worst problems dog owners have is teaching their dogs to stop barking for no reason. Constant barking is a problem that will get under your skin and will only get worse as your dog gets older. 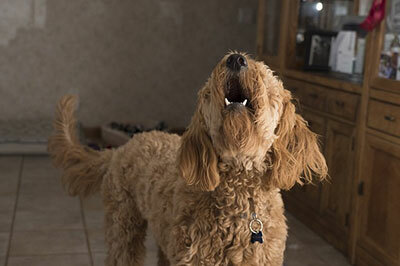 Many dog owners will find that adult dogs can be almost impossible to train once barking has become a habit. It’s very important that you do get your dog trained before the constant barking becomes a habit. In this article were going to take a look at some of the things that you can do to control dog barking. The first step to learning how to stop dog barking is finding out why your dog is barking. Sometimes this isn’t as obvious as you might think. You might have a nasty neighbor who likes to tease your dog. Many dog owners do not even know that their dog is barking all the time when they are gone. There may be some neighbors kids who walk by everyday and throw stones and scream at your dog. Sometimes you have to think a little outside the box. Once you know what is causing your dog to bark you can go about training your dog. There are some cases where training won’t even be needed. For the examples above you would need to move your dog inside to stop your annoying neighbors from bothering your dog. Another very common reason dogs bark is out of boredom. This is often when your dog just keeps barking and barking for no apparent reason. When your dog is like this try taking it for a walk. If the dog is still barking when you come back, then you may have a different problem all together. If your are really stuck with this barking problem you may want to consider some devices or collars. There are many dog owners who hate the idea of using a shock collar, but a shock collar will not do harm to your dog. The real key is to use the shock collar correctly. A good option is to look for a collar that lets you play around with the shock settings. This makes sure that your dog will not be harmed in anyway. Do remember to start your training with defining why your dog is barking first. This will make the training allot easier. Allot of dog owner have little understanding as to why their dog is always barking. This often leads to a very flustered dog and owner. Yes, the barking could be as much of a problem for your as it is for you. This entry was posted in Training and tagged barking by Vic Bilson. Bookmark the permalink.